When “Weird Al” Yankovic was recording “Belvedere Cruising” in his home back in the 1970s, he probably never expected that he’d have a coffee-table book about him one day. At least, I would hope not, as that would probably betray a strangely-specific form of narcissism on Al’s part. 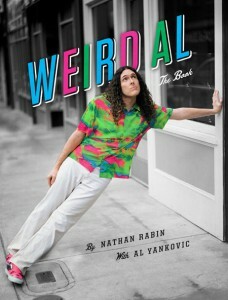 If Al DID, though, I’d bet he’d expect one as good as Weird Al: The Book, by the AV Club’s Nathan Rabin. Weird Al: The Book acts as a more truth-based biography than The Authorized Al, the previous book about Weird Al, and comes with loads of cool pictures, lyrics, tweets and jokes by Al throughout. I do wish Rabin’s text were a bit longer — but then again, I’m a huge Al fan, so if Weird Al: The Book were 1600 pages, I’d probably still think it was a little short and skimmed over seconds 788,994,545 through 788,995,603 of his life. Still, there are a few things I’d wish there’d been more about, like Alapalooza, which only gets about two pages, or the UHF Soundtrack, which barely even gets a mention. The amount of love going into the book, though, makes up for any shortcomings (again, mostly due to the book not being the size of ten phone books). The design is great — which is probably paramount in a coffee-table book like this — and Rabin clearly knows his stuff. The photos and captions, both provided by Al himself, are a mix of revealing (in a digging deep, peeling back the layers sense) and hilarious. To be honest, there’s not a whole lot to say about this book — and honestly, I figure just about any Al fan already has it and has devoured it the day it came. Just like I did. But if for some reason you’ve been holding out — get it. And if for some reason you don’t like Weird Al, you are wrong and you should look into getting that fixed.